When it opened in 1966, Edmonton’s CN Tower was the city’s first skyscraper and Western Canada’s tallest office building. The 27-storey downtown international-style structure was an early example of podium/tower design. 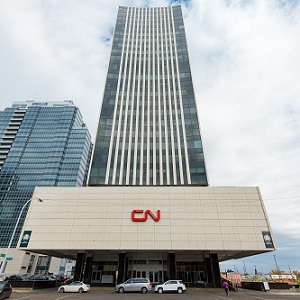 With the city’s CN passenger train terminal at its base, the building was a bustling hub activity housing CN’s Edmonton offices. However, CN closed its downtown station and vacated the building in 2008, leaving behind its giant red CN logo atop the tower. In the recent tough economic climate, the aging striped white and black tower, now dwarfed by a number of neighbouring glass behemoths, might have been expected to languish, largely vacant, like many B- and C-class buildings in Alberta’s two major cities. A practically perfect location, refurbishment and rejuvenation, and a flexible leasing strategy on the part of building owner Strategic Group is allowing the CN Tower something of a renaissance, however. Randy Ferguson, COO of Calgary-based Strategic Group, says his firm acquired the tower a number of years ago in a distress sale. The company conducted a study on whether the building would be better used as a hotel or for residential purposes but came to the conclusion its real value was its location as a highly visible office asset. “We did appreciate there was new office product coming to market, that the building would require modernization and it would be many years to stabilize the asset,” he said. “But, we committed ourselves to do that. So, we began an investment that included upgrading mechanical systems, and elevator systems and building security. “But what happened in the meantime even caught us a little bit by surprise . . . how the location of CN Tower came into its own. Suddenly right beside it is the Royal Alberta Museum. And right beside it on the other side is the new ICE District and Rogers (Place). The area around the building began to transform itself. The CN Tower is in a class of buildings which is seeking its footing as Edmonton sprouts a new crop of A- and triple-A buildings in the rejuvenated core. “(The CN Tower) is considered B+. That’s a class we invented for ourselves,” says Ferguson. The broad base of the building is attributable to its original purpose as a train station. With the trains coming in under the main floor, the parking for the building was built above the lobby rather than underground. The slim tower rises above the parkade podium. The building has 254,000 square feet of office space. Ferguson says Strategic recently completed renovating 156,000 square feet of the space to accommodate tenants. The biggest tenant is Alberta Health Services, which added 180,000 square feet to its lease in 2017. Another of the larger tenants is the Bredin Centre for Learning with about 30,000 square feet. Bredin is an example of the flexibility Strategic has by virtue of its space inventory throughout the city’s downtown. The training institute had been housed in Harley Court, an under-utilized office building in the west end of downtown which Strategic has converted to residential. Strategic was able to accommodate the school in the CN Tower along with some other Harley Court tenants. Strategic also has a flexible policy toward startups and new companies, which is becoming a key part of the real estate scene in the downtown core. “The markets of Alberta have changed from the requirements of large format open space which was largely driven by our energy industry, toward companies that are occupying smaller square footages,” Ferguson says. “Companies in the early stages of their development aren’t sure how they want to grow, or when they’re going to grow, or sometimes even if. “What we enjoy about working with startups and newcos is to make sure the companies are properly housed in each stage of their development. That has played out in the CN Tower in terms of some young tech and health tech tenants moving in. The building’s location again plays into the concentration of that sector, says Ferguson. Tenants also include architecture, law and tax accounting firms, engineering and design, but there are no oil and gas-related firms in the tower. Ferguson says that is certainly not by design; Strategic believes in the energy industry going forward. It’s just that those companies haven’t found the CN Tower yet. Although the building dates from the 1960s, Strategic isn’t putting an expiry date on it. The lobby was renovated in 2014, and a fitness centre is opening this summer in the old train terminal space as well as bike storage and showers for bicycle commuters. There is a daycare planned for the main floor. The exterior of the entrance will also be freshened up with new materials and lighting. The iconic features of the building remain. Ferguson says there are no plans to remove the giant CN sign on the top of the tower. And there is, of course, no way to change one of the architectural features of the tower, which although it appears rectangular at first glance, is not. “The walls on the east and west sides are not straight. They’re actually convex. When you’re looking down at the floorplate it’s noticeable,” says Ferguson.